This is a beautiful sink. Having the versatility to either have a smooth front or the more decorative front is the reason I chose the sink. The decorative front offers something more unique than what you see in your typical farmhouse sink. It looks amazing with our new granite. 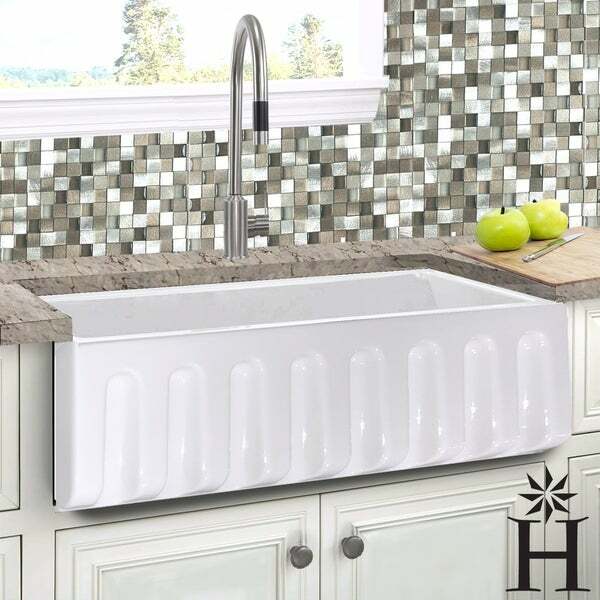 Update your kitchen with this large 33 inch single bowl Italian fireclay farmhouse kitchen sink from the Highpoint Collection. This sink is reversible to let you choose the fluted or plain apron. It is made from fine fireclay and finished with a white porcelain glaze that is resistant to acid and alkali to preserve the look of the sink. This white farmhouse kitchen sink fits in with any rustic or cottage style kitchen decor and will instantly become a stylish focal point in your home. Though not visible when installed, the arches on the side walls help to provide structural strength to the sink. Fireclay sinks will show small curing cracks on the underside of the sink. This happens during firing and do not go through, having no bearing on the performance of the sink. Dimensions 18.0 In. X 33.0 In. X 10.0 In. I looked near and far for an affordable farmhouse sink. I struggled with fireclay vs acrylic vs stone vs steel. After a lot of research, I ended up deciding on this one. My initial impressions are positive. It ended up being a little smaller than the dimensions (about half inch), but it is definitely a substantial and well-built piece. I haven't noticed any issues with scratching, but we are using a sink grate. I love this sink, It is absolutely beautiful in my newly remodeled kitchen. Exactly what I was looking for. I will add a photo once the faucet is installed. 5 stars.! This is a beautiful sink! The sink is very heavy and appears to be very well made. 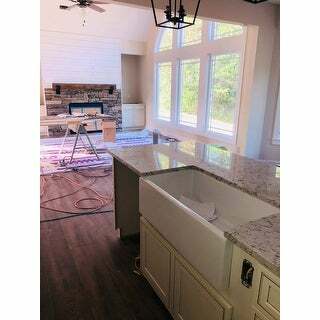 I am putting the sink in a new construction home and can't wait to incorporate it into my new kitchen. Beautiful sink! Haven’t had the chance to use it yet. The first one had a tiny chip in it and overstock was great with the exchange!!! I love the aesthetics of this sink. It has the cleanest lines and is finished perfectly. It is the perfect addition to any kitchen, particularly a rustic one. I am pleased with this purchase. I would certainly purchase from Overstock again. Overall great experience. Since I build homes, this is the 3rd time I've ordered this product. It's good quality and looks great. The price is attractive as well. Very nice and well made farm sink. Ordering was so easy and it arrived fast. Packaged very well. I Love it. No problems with it what so ever. I will definitely order more from them. Thank you for a good experience. I bought 2 of these for my kitchen renovation and they are exactly what I was looking for. I have the smooth side facing outwards but you could just as easily use the rippled side if you prefer that look. These are very heavy but are absolutely beautiful. And a great price! Highly recommend! Sink has been installed and looks fabulous! It’s spacious & very easy to clean! Get compliments on it all the time!! Luv it! Beautiful, sturdy sink. Very happy with product, symmetry and ease of install. Durable product, broke a porcelain dish or two in it and had a pan slip, still no worse for the wear. Absolutely love our sink! It's beautiful and completes are kitchen with charm. Love this sink, the fact that it is reversible is awesome. It is pretty heavy but came packaged very well. The carpenter had no problem following the diagram that was provided in order to make the the appropriate cuts in the island. Overall quality looks great! Unfortunately mine has a scratch so I'll have to have a new one sent out. If it would have been scratched on the other side it would have been covered and not mattered. Looking forward to my new one. "Is the color bright white? The picture shows it brighter than other white sinks "
The sink is a classic bright white glaze. The difference is only in that the product images are shown at a lower exposure to show the details (edges and curves) of the sink. "What is the cut out of this sink? " "Where can I find a sink protector for the bottom of this sink?" We do not currently have a grid available for this sink. You may measure the bottom basin of the sink and look for another manufacturer's in that size. Typically there is .5-1 inch space between the sink wall around the grid. "Has anyone found a grate that fits this size sink?" "Can this go on a 33” base? " Possibly it will fit in a 33" apron base cabinet because the sink measures 33" wide at the top of the sink and there is a slight taper. That said, we always recommend receiving your acutal sink and measuring it before purchasing a cabinet as the dimensions are nominal only and can vary in either direction by up to .5". "i see the other HP sinks have the drain and grid with them. Does this one? the description isn't as clear as the other HP sink descriptions on your site." The drain is not included.